Dine indoors Dining table Every piece of furniture was meticulously selected Hard wood floors Seating area Master Bedroom Master Bedroom Work space table with comfortable chair En-suite Master bath Kids or Guest room Twin Beds for flexibility Second full bathroom convenient washer dryer So many areas to relax or socialize Screened in Porch with cozy cabana style seating Large Pool Pool and outdoor table for breakfast or BBQ All the spices you`ll ever need Entrance is welcoming. Gardens are well kept. A garage to keep your car cool. Style, comfort, European linen, quality kitchen, lots of character yet not overwhelming or too personal. Quiet neighborhood with over 95 acres of green. Ideal for family or couples. 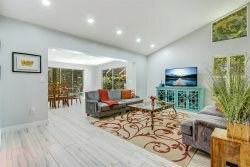 Minutes from downtown, Las Olas, and the beaches. Tranquil lush streets offer an excellent opportunity to walk or bike. One Car garage, very private with the garden which encircles the property from neighbors on all sides. The backyard is completed with a beautiful pool. Complete kitchen stocked with quality silverware and plates. Living room with brand new furniture. Dining Room seats 4-6. Den with 34" TV with views of the garden, L shaped sleeper couch. WIFI and work desk. Screened patio with daubed and canopy, sheer curtains create a mood for relaxing, or snuggle in egg chair swing with a book, looking out at the pool. The deck features a seating area for group conversation or a glass of wine. Located in one of the largest and most traditional neighborhoods in Ft Lauderdale, Victoria Park is one of the most beautiful Arbor streets in Ft. Lauderdale. With tree over 100 years to provide shade while you walk, jog bike through the area. My family greatly enjoyed our time at this cozy home. We felt like we were on a true getaway with the lush landscaping and pool. The owner was beyond accommodating and we only with we could have stayed longer. Beach chairs and cooler in the garage, loungers near the pool, a grill, front load washer and dryer, dishwasher, microwave, oven, iron and board, hairdryer, his and her robes in master, lush bath sheets (the bigger plusher towels). Original art photography throughout, for the cyclist especially. If you would like the pool heated during your stay, there is a $20 fee per day. Please coordinate with us prior to your arrival so that we can arrange for the heater to be on. This property is equip with NoiseAware. NoiseAware works like a smoke detector, but for noise. Our simple plug & play sensors track the decibel levels at your property, evaluate other risk factors and send an alert via text or email if the noise levels exceed your chosen threshold level.